Reader Greg Johnson sent in this photograph he took recently at Flag Pole Hill. 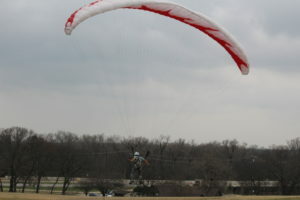 The parasailor was trying to take off from the top of the hill and make it over power lines, Northwest Highway and nearby trees to fly over White Rock Lake. He did not succeed. Congratulations, Greg! You just won a $25 gift card to a favorite neighborhood restaurant. Submit your favorite photo of the lake and its surrounding areas to editor@whiterocklakeweekly.com. You could be our next winner!